Mediterranean theme based The Village Mall in Jumeirah Dubai is not only a home to various shops, boutiques and outlets, but it also has a wonderful Thai restaurant tucked in it. This Thai eatery is known by the name of Thai Time restaurant and it serves authentic food of Thailand in this mall. The basic look of this eating place is more like a cafe rather than a typical restaurant, but its environment is cheerful and staff is also friendly and polite. Customers will get to enjoy a number of delicious Thai dishes in this small restaurant and that too at reasonable prices. Since Thai Time offers both veg and non-veg Thai fares, therefore it attracts lot of customers who can also tailor dishes as per their liking. 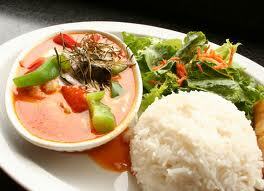 This Thai eatery offers a fine range of Thai dishes that will tease your taste buds with their appetizing taste. Each at this bistro is tailored as per the requirement of the client, which makes this venue different than the others. Moreover, ingredients are labelled under every dish, so customers know exactly what they are eating. Appetizers like crab, chicken and prawn cakes are the highlights of Thai Time. Aside from this, well decorated Thai vegetarian dishes are also a part of this restaurant’s menu. In addition to this, seafood and variety of desserts are also on the carte du jour. Take away service is another significant feature of Thai Time, as with this attribute guests can now enjoy its lip smacking food at their own place as well besides dining in at this eating venue. In brief, this family friendly restaurant has lot to offer for every kind of visitor. Thai Time opens daily and its opening hours are from 11:30 am to 10:30 pm. 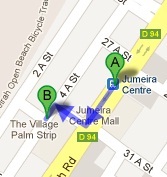 The Village Palm Strip - 4 A St - Dubai, United Arab Emirates. Thai Time has no metro station within its 2.5 kilometres distance. Therefore, the best way to reach this venue is by bus or car. Head southwest on شارع جميرة‎/D 94, after arriving at this bus station and then turn right towards 4 A Street, before making a left turn onto 4 A Street, where your destination is sited on the left side. Checkout map for directions.